One of the fundamental principles that underlies human rights is equality between human beings. The first article of the Universal Declaration of Human Rights proclaims that “All human beings are born free and equal in dignity and rights”. The obvious consequence of this principle is non-discrimination. Discrimination occurs when people in the same situation are treated differently for no objective reason. Unfortunately, in our modern world, many factors still give rise to discrimination, including people’s ethnic, religion, gender, sexual orientation, age, state of health, etc. Racism is a form of discrimination based on claims of ‘race’. Now that globalisation has made our societies more multicultural, the risks of racism in particular have also increased. 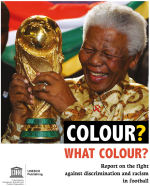 Within the framework of their partnership with Juventus, UNESCO commissioned a report that focuses on discrimination and racism in professional football. It provides an overview of the historic and theoretical background, reports on the state of affairs on the ground. It also summarizes what has been done and what is being done to tackle racism and discrimination in football, how the effects of these actions can be evaluated, and which new avenues for action are promising. On the international day against racism and discrimination, KAA Gent called for respect on the pitch and in the stands by making visible the Elk Talent Telt charter with the hotline against discrimination. The Elk Talent Telt asked all football clubs in Gent, their players and supporters to be alert towards discrimination and to signal every incident. This initiative gave clubs a view of the size of the problem and was the opportunity to tackle the problem through mediation with the KAA Gent Foundation. A video was also released to raise awareness on this issue. In the last couple of years, Ferencváros TC of Hungary has long been involved in a strenuous fight against racism and discrimination in general. The club produced various videos as they strive to indicate that Fradi “always fights hard against discrimination” and that “Only our hearts are green-white”. Being the first football club in Hungary supporting the cause, Ferencváros won the Fair Play Award by the Hungarian Olympic Committee. Earlier this year, Inter Milan launched an anti-racism campaign which aims to reclaim the so-called “buu” sound often associated with racist insults. The campaign turns the letters of the word “buu” into an acronym for “Brothers Universally United.” A video was released with former players such as Luis Figo, Javier Zanetti and Samuel Eto’o. Apollon Limassol is a leading team in community involvement. The club was awarded by UEFA for the rich social work they have done, and especially for the anti-violence and anti-racism campaigns. 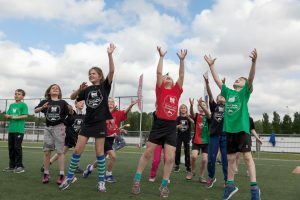 Started in 2015, ”Teamplay ohne Abseits” (”Teamplay without Offside”) is an initiative from FC Redbull Salzburg which aims to use football as a common way of raising awareness for issues such as discrimination, tolerance and integration. Through a range of exercises, the youngsters learned to recognise prejudice along with biases against others, and to understand how discrimination and disparagement come about. ”Equality = The Only Choice” is an on-going independent project carried by GNK Dinamo since 2012 in order to stand against racism and discrimination in football. The club recognise the equality between everyone around the world, and the right to live a normal life and to develop themselves freely, regardless of places of origin, life opportunities, skin colours or capabilities. See the video here. 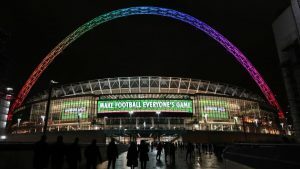 These are just some examples of the work that has been done throughout the world football family in fighting racism and there are a lot more, from UEFA’s ‘No to Racism‘ to ‘Kick it Out‘ which is now in it’s 25th year to the UK’s ‘Show Racism the Red Card‘. Nevertheless, the evidence of the recent incidents noted above shows there is still work to be done in this area.